For a second time, Congress pushed hard to reach a deal for government funding past midnight but failed. This has lead the federal government to a shutdown in just three weeks since the previous one. Senate had originally reached a deal the previous day, it focused on lifting spending caps and raising military spending and the bill was stalled in the upper chamber for hours. Kentucky Republican Rand Paul held up a vote to protest the increase in the federal deficit. Republicans held him responsible for grandstanding and for wasting their time. While the hours crept by to pass a bill, the White House instructed the Federal government to prepare to halt or scale back several functions. The failure to pass a budget bill has now become common in Washington. Earlier, this year the government had shut down for three days as Democrats blocked the bill to try and force a compromise. The Republicans pushed the government to shutter back in 2013 to try and undo Obama’s healthcare law. As the deadline rolled by, Mr. Paul delayed a vote with a lengthy floor speech railing against an excess spending by the government. He expressed that his colleagues were abandoning their commitment to reducing the deficit and about the relentless spending on a perpetual war. He felt that his Republican senators were not on the same page against deficits like when they were against Obama’s deficits and claimed that this was intellectual dishonesty. Also, he suggested that the country is worth a debate till three in the morning before he concluded. In a similar fashion, the budget bill awaiting votes could not replace the lapsed immigration program that is otherwise known as Deferred Action for Childhood Arrival (DACA). This afforded nearly 800,000 young immigrants’ protection from deportation and work permits. Trump has tried to end this initiative and has begun the suspension to push for a larger immigration deal. Democrats looked to have a DACA fix as Congress passed a series of short-term budget bills. House Minority Leader Nancy Pelosi took the floor and had a record eight-plus hour speech highlighting inaction. The Democrats forced a multi-day government shutdown this year by blocking the budget bill that simply left out immigration. The Speaker of the House, Paul Ryan promised a resolution to pass a new Budget Bill that would sidestep the issue. How Does a Government Shutdown Affect You? Income Tax: IRS would stop refunds and processing paper tax returns. Social Security: No new applications would be accepted or processed but benefit checks would still continue to come in the mail. Welfare: Checks would continue but new applications would not be processed. Border Patrol: This will function without a glitch. National Defense: All armed services would continue duty but not paid on time. Mail: Deliveries would continue as the US Postal Service funds itself. National Parks and Tourism: These would probably be closed and visitors would be told to leave. Nonvolunteers and fire control would be shut down. Park police will continue as usual. Make sure you cancel your plans to visit Niagara Falls and the Statue of Liberty during the shutdown. Transportation: Air traffic control, Coast Guard, and TSA security personnel will remain in their jobs. Science and Technology: Due to the shutdown, NASA would be closed and that would mean that 85% of staff are furloughed. SpaceX Falcon 9 would not be affected as the launch would take place in March. EPA’s 14,000 employees will continue working as they have sufficient resources. NOAA has a shutdown except for the department that monitors hurricanes and flight planning. USDA: Food safety inspections will continue but farm credit, loan programs, and rural development will close down. Justice System: Courts will remain open and so will police and other law enforcement personnel. The US Constitution allows for all expenditures of federal funds to be authorized by Congress with the approval of the US President. The federal government and the budget process work on a fiscal cycle from October 1 to September 30. If Congress does not fail to pass the spending bills comprising of the annual federal budget or resolutions, then it will be forced to extend spending beyond the fiscal year. If the President signs or vetoes any individual spending bills, this may force the Federal Government to cease due to lack of Congressionally authorized funding. 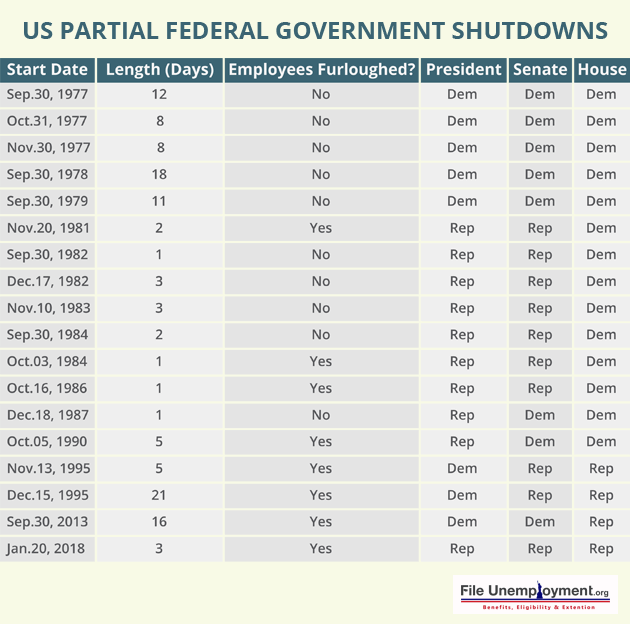 There have been six government shutdowns since 1981. Four of the last six government shutdowns were not regarded but the federal employees were affected. In the last two, the people did feel the pinch. In 1981, President Reagan vetoed a resolution and 400,000 federal employees were forced to go home and not return after lunch. After a few hours, President Reagan signed a new version and had the workers back the next morning. Again in 1984, with no approved budget there were 500,000 federal workers that were sent home. Then in 1990, there was no budget or resolution, the government shuts down during the three day Columbus Day weekend. Most workers were off and after President Bush signed the spending bill and everyone was back on Tuesday. 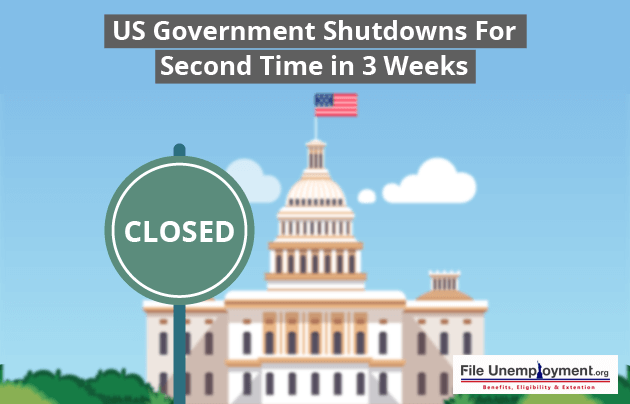 In 1995 and 1996, there were two government shutdowns that began in November and idled at different functions of the federal government and also at different points in time in April 1996. These shutdowns were due to a budget impasse between Democratic President Clinton and Republican-controlled Congress. Then there was the 2013 government shutdown for 17 long days from October 1 to October 16. This saw the shutdown of more than 800,000 federal employees because of disagreements between Republicans and Democrats over spending. It was only on October 17 that Congress faced a debt limit crisis and increased public disgust. Finally, the first shutdown of 2018 started on January 20. This was due to the bill failing to pass Senate’s 50 to 49 vote with the majority of Democrats voting ‘No’. Issues that arose out of the immigration and funding DACA were of the primary concern. Currently, the second funding gap began at midnight on February 9. As long as you have already submitted your unemployment claims, you would not have to worry apart from a little delay before it gets processed. Also, if you are already receiving unemployment benefits then you will continue to receive your checks in the mail. In a few days, all services will be restored and you will be able to access all government departments.